Urns from Stromberg Architectural Products can be functional and decorative. Made from GFRC, (glass fiber reinforced concrete), these urns can be garden ornaments as well as architectural details. Place urns anywhere in your home to enhance decorative themes, accent furniture or add a touch of the exotic. Stromberg has brought the best selection and the highest quality GFRC urns to the marketplace. They’ve created urns for hotels, resorts and commercial buildings all around the world. They offer their customers free initial estimates, as well as assistance with design, models and maquettes. If you have a specific idea in mind, they’ll work with you to bring it to completion. Additionally, you can also choose from their large array of stock designs. Stromberg Architectural is a multinational manufacturer of quality architectural products. They pioneered the use of GFRC and it’s become their most popular material because of its beauty and versatility. You’ll have a wide variety of finishes and textures to choose from for your GFRC urn when you choose Stromberg. 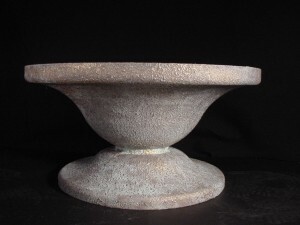 GFRC urns from Stromberg are durable and water tight. Urns work great as patio planters, ornamental lawn and garden touches, and as decorative borders. Glass fiber reinforced concrete urns combine elegance with practical finishes such as stone, terra cotta, and wood. Varied color options are also available to help match existing décor. Stromberg GFRC is a green material and your urn will beautify any indoor or outdoor location without harming the environment. Glass fiber reinforced concrete is very low maintenance and can stand up to any kind of weather condition. You can add an upscale touch to your décor with a GFRC urn from Stromberg and know that it will stand the test of time. Stromberg Architectural has a team of craftsmen and production specialists that will work to make your GFRC urn project meet all of your demands. They offer their customers free quotes and initial consultations as well as assistance with design and CAD details. Call them today at 903-454-0904, or email them.